Whenever I have the chance to travel, my favorite form of tourism is exploring local grocery stores. While that might not sound too exciting, it's amazing what you gluten-free finds you can uncover, which always leads me to bring home way too much food from wherever I travel. 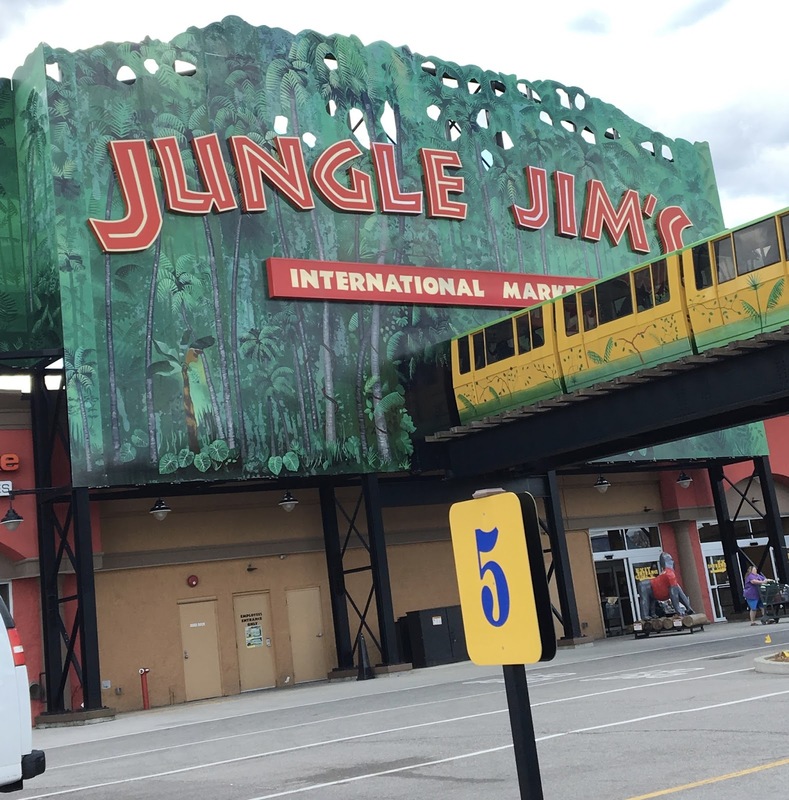 When I knew I would be headed to Cincinnati for spring break, I knew a stop to the Jungle Jim's International Market would be in order. This outlandish, larger-than-life food bazaar brings together an unbelievable assortment of American and International foods, making this less of a store than a destination. 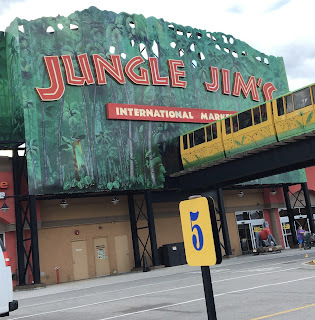 Almost theme park-like in it's theming, Jungle Jim's definitely is fun for kids and adults alike. 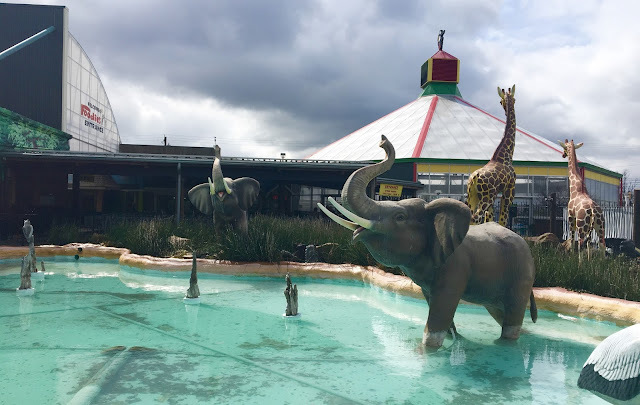 With two locations (Fairfield and Eastgate), Jungle Jim's is definitely a must-do attraction, and I ended up visiting both during my couple days in the area. 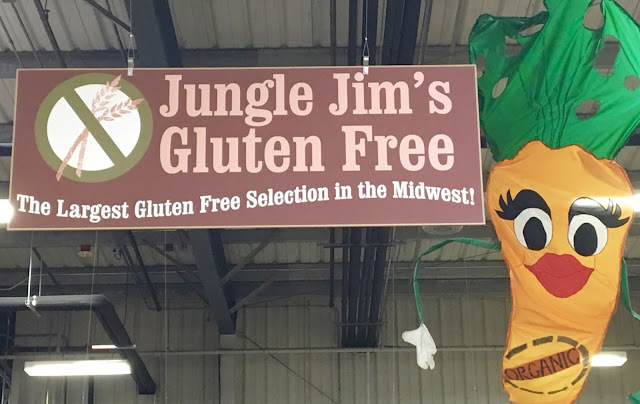 What I discovered is that Jungle Jim's goes beyond the kitsch and really is a great resource for gluten-free eaters, as it has the "largest gluten-free section in the Midwest." The experience begins as soon as you arrive. Life-size animals, sound effects, and a festive atmosphere greet you, affirming that this is no ordinary experience. 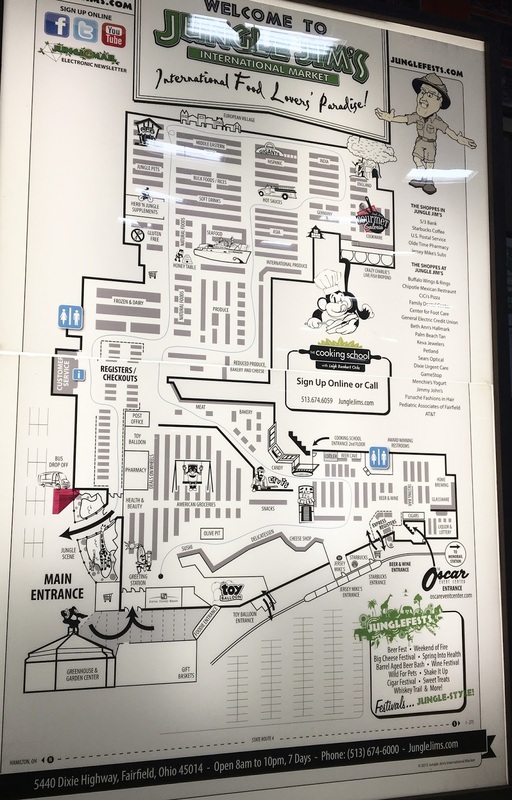 How many grocery stores do you go to that you need a map to navigate? This is one where you'll want to grab one on the way in because it's easy to get lost. Of course as a foodie and gluten-free blogger, my jaw dropped to the floor when I saw this banner hanging proudly above dedicated gluten-free aisles in the natural foods section. 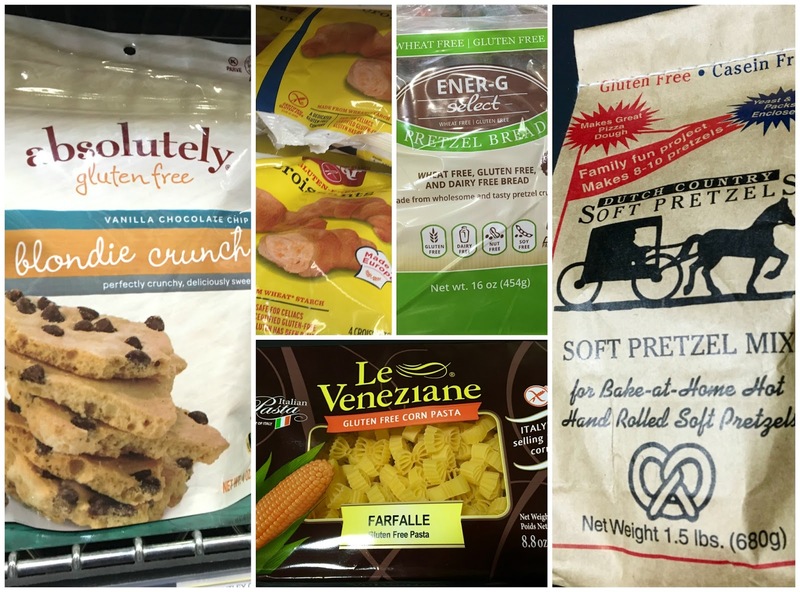 Imagine rows and rows of pastas, crackers, baking mixes, and tons of other gluten-free items all collected in one place. Nearby freezers also showcase a variety of intriguing products. It was a little bit overwhelming, and I was giddy after seeing product after product that was new to me. Below is a collage of only some of the interesting finds I discovered. Schar croissants? Pretzel bread? Bow tie pasta? Check, check, and check. I wish I could have taken so many items back home with me, but due to suitcase limitations, I had to selectively choose only a few items to bring back. Largely, prices were really affordable, which made me envious of locals who can regularly shop at Jungle Jim's. What was really cool was seeing end-caps featuring two local bakeries I discovered at the Gluten-Free for Cincinnati expo hours before (click here for recap). Chubby Bunny Bakery (gluten-free and vegan) and Tina's Sweet Treats (gluten-free with a few dairy-free options) had a plethora of delicious looking goods including cupcakes, cookie sandwiches, and Belgian waffles (check the freezer aisle). It was awesome to see local bakeries represented, which provides an easy way to support them! Read my Chubby Bunny Bakery review at this link. A review of Tina's Sweet Treats items I tried will be posted soon. I visited their Eastgate location on a weekday and their Fairfield location on a Saturday and there was definitely a difference in crowds. If visiting on the weekends, do anticipate a crowd- which can either add to the festival atmosphere or be claustrophobic. Nevertheless, it's worth braving the crowds, as there's so much to discover and explore. 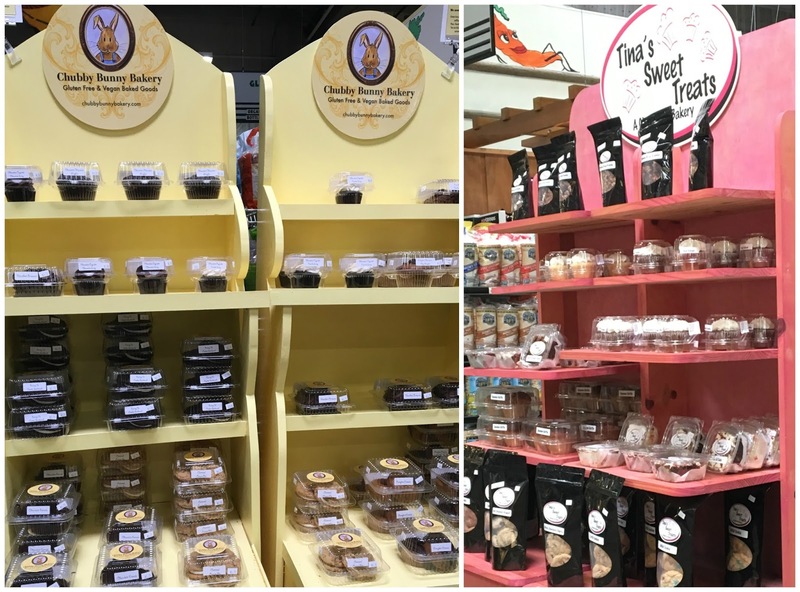 Although this post focuses on the gluten-free section, there are aisles and aisles of international foods, which are worth exploring, providing an opportunity to globe trek without leaving Ohio. Live in the Cincinnati or Northern Kentucky area? Order a gluten-free crate from Jungle Jim's on their website. For information on location, hours, and more info about the stores, click here to visit Jungle Jim's website. Disclaimer: I purchased some products shown independently. I was not influenced or compensated in any way, and all opinions reflected are mine, and mine alone.